My preview of the 18s ITF Grade 1 Eddie Herr tournament has been posted today at the Tennis Recruiting Network. 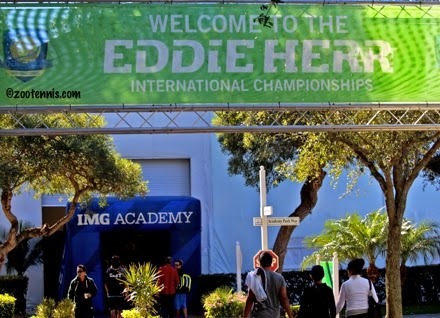 My preview of the 12s, 14s, and 16s divisions of the Eddie Herr International was posted on Friday. Qualifying was completed in the boys 16s Sunday morning, on another perfect day for tennis at the IMG Academy. The 18s qualifying was scheduled to finish the second and final rounds today, and the girls qualifiers have all been decided, but two boys matches were not completed before darkness arrived and those third sets will be finished Monday. The girls qualifiers in the ITF tournament include three Americans: Kyle McKenzie, Jessica Livianu and Taylor Russo, none of whom were seeded. McKenzie was originally scheduled to play the top seed in qualifying, Olesya Pervushina of Russia, but Pervushina moved into the main draw, leaving McKenzie against a qualifier. The 16s USTA champion lost only one game in that match and only six in her two wins Sunday, beating Jenna Dean 6-2 6-0 and Abigail Desiatnikov 6-3, 6-1. "I was prepared for a tough match, because I knew she was a really good player," McKenzie said of Pervushina. "It was a little surprising because I found out just as I was going on to the court, so I had to change my mindset a little bit. But I'm playing well, so it's been good." McKenzie, who is only 15 herself, admitted that playing the 13-year-old Desiatnikov presents some challenges. "She's a great player and it definitely puts a little more pressure on you when you're on the court, maybe a little more tension," said McKenzie, who said she practiced a few days on clay at the Carson facility before her trip here Wednesday night with the USTA. "But that's something I've definitely gotten better at, so I don't think it affects me quite as much as it used to." The other qualifiers in the girls draw are Veronica Miroshnichenko, Karine Sarkisova and Aleksandra Pospelova of Russia, Rebeka Masarova of Switzerland and Ema Lazic of Great Britain. Two US boys reached the main draw, with Vincent Lin defeating top seed Igor Ribeiro Marcondes of Brazil 6-3, 7-6(6) in the second round and Chase Burton 6-2, 6-0 in the final round of qualifying. Emil Reinberg completed his straight-set route through the qualifying with a 6-4, 6-2 win over Dane Dunlap of Canada. Kentaro Mizushima of Japan, Christian Sigsgaard of Denmark, Jack Van Slyke of Canada and 14-year-old Yshai Oliel of Israel are the other boys qualifiers. Ricardo Roberto of Italy and Enrique Asmar of Colombia are 4-4 in the third set of their match, and Lucas Koelle of Brazil leads Juan Hernandez Serrano of Mexico 5-1 in their third set. CiCi Bellis and Yunseong Chung of Korea are the No. 1 seeds, and both are in action on Stadium court on Monday. Chung is first up at 8: 30 a.m. against wild card Jacob Hansen, while Bellis will follow that match on court, against 2013 16s Orange Bowl champion Charlotte Robillard-Millette of Canada. The first round is split over Monday and Tuesday. The draws and order of play can be found at the tournament website. The first round in all the younger age divisions are being played Monday, starting with the boys 12s at 8 a.m.
Late last night at the Yucatan Cup, No. 2 seed Taylor Fritz avenged his two losses to World No. 1 Andrey Rublev of Russia, winning the ITF Grade 1 title by a 6-4, 6-3 score. Fritz, who took a wild card into the tournament in Mexico this week, had lost to Rublev in the semifinals of the Grade 1 in Roehampton on grass and in the round of 16 at the US Open, so for Fritz to post a straight-set win on his least favorite surface is probably doubly satisfying for the 17-year-old California. Fifteen-year-old Sofya Zhuk of Russia took the girls title, winning 7-6(3), 6-4 over Luisa Stefani of Brazil. Jaqueline Cristian of Romania and Dalma Galfi of Hungary won the girls doubles title with a 1-6, 7-5, 10-5 victory over Stefani and Akvile Parazinskaite of Lithuania. Weather conditions were close to perfect on the final day of qualifying for the 12s, 14s, and girls 16s Saturday at the IMG Academy's Eddie Herr International. Cloudless skies gave the sun an opportunity to burn away the morning chill as eight winners in those five draws moved into Monday's main draw. The boys 16s qualifying draw will be completed on Saturday, as will the ITF division qualifying, with two rounds played in the latter. 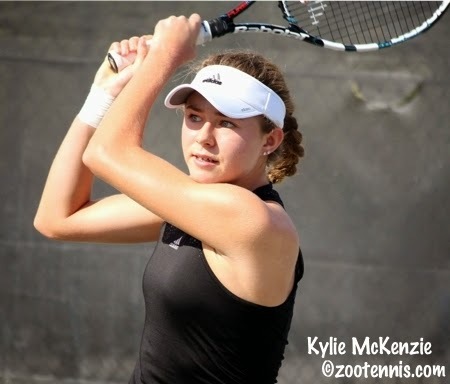 In the first round of ITF qualifying, 16 of the 29 American girls advanced to the second round, including Kylie McKenzie, the USTA 16s champion. McKenzie was originially scheduled to play top qualifying seed Olesya Pervushina of Russia, who moved into the main draw late last night. So an alternate, Ayumi Sasaki of Canada, took Pervushina's place and McKenzie rolled to a 6-1, 6-0 win. Anastasia Mikheeva and Emily Smith of Great Britain also moved into the main draw prior to the start of qualifying today. One first round match in the boys qualifying was not completed before darkness suspended play in the third set, but it did not involve an American player. A dozen US boys advanced to the second round, including seeds Alexander Lebedev, Emil Reinberg and Jake Gabay. The main draw ITF girls wild cards are Ingrid Neel, Caroline Dolehide, Emma Higuchi, Francesca DiLorenzo, Claudia Wiktorin, Nicole Johnston, Daniela Pedraza Novak of Colombia and Maria Shishkina. Shiskina told me today that she had one wrist surgery last November and needed a second this past August, with the Eddie Herr her first tournament since then. The ITF boys wild cards are Walker Duncan, Stephen Madonia, Jacob Hansen, Alfredo Perez, David Mitchell, Victor Li of Hong Kong, Oscar Janglin of Sweden and Daniel Hobart of Australia. 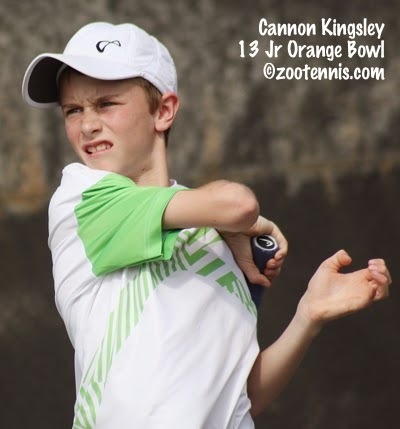 Nathan Ponwith and USTA 16s champion John McNally moved into the main draw, Hady Habib received a special exempt spot, and Kalman Boyd, Tim Van Rijthoven of the Netherlands and Jake Delaney of Australia withdrew. Complete results and the order of play for Sunday can be found at the tournament website. Habib did not have to play qualifying due to making the doubles final at the Grade 1 in Yucatan, and he and partner Anudeep Kodali took the title today, defeating Fabian Fallert and Tim Sandkaulen of Germany 7-6, 6-4. Taylor Fritz, the No. 2 seed, will play top seed (and doubles partner) Andrey Rublev of Russia in the boys Yucatan final later tonight. At the ITF Grade 5 Goombay Splash Bowl in the Bahamas, 15-year-old Victoria Emma, seeded fifth, won her second ITF singles title, defeating unseeded Jacqueline Pelletier 6-1, 6-1 in the final. Alvaro Regalado Pedrol of Spain won the boys title, defeating No. 5 seed Robert Loeb 7-6(5), 6-4. Sebastian Memersky won the boys doubles title with Canadian Alexander Donski and Naomi Waters partnered with Laura Fabrizi of Venezuela to take the girls doubles title over Emma and Alexandra Angyalosy. 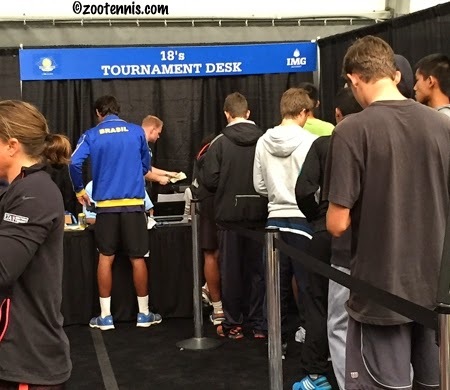 The Eddie Herr is a huge tournament, with eight separate 64-player draws. So for my previews for the Tennis Recruiting Network, I split the ITF Grade 1 event from the 12s, 14s, and 16s, with the younger age group article going up today, and the ITF preview coming on Sunday. The qualifying for the younger age divisions began Wednesday, and the eight qualifiers will be decided on Saturday morning in the Boys and Girls 12s, the Boys and Girls 14s and the Girls 16s. Due to rain on Wednesday morning, the Boys 16s draw has only reached the round of 32, so their qualifying will extend to Sunday. The draws and order of play for all Saturday's qualifying matches can be found at the tournament website. The 18s OOP is a separate document. World No. 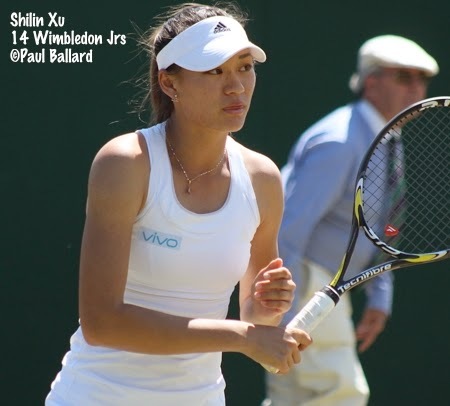 1 Shilin Xu was entered in the Eddie Herr, but she withdrew today, after reaching the semifinal of the women's Asia-Pacific Australian Open Wild Card Play-off. The 16-year-old, who received a wild card into the tournament, played in Shenzhen China, beat No. 4 seed Miharu Imanishi of Japan in the second round and will face 37-year-old Tamarine Tanasugarn of Thailand for a place in the final. Eighteen-year-old Hyeon Chung of Korea has also reached the semifinals of the men's tournament. At the ITF Grade 1 ITF in Yucatan, the girls final is set, with No. 5 seed Sofya Zhuk of Russia facing No. 7 seed Luisa Stefani of Brazil. Zhuk took out Grade A Abierto Juvenil champion Dalma Galfi of Hungary 1-6, 6-4, 6-2 and Stefani upset top seed Marie Bouzkova of the Czech Republic 6-4, 6-1 in today's semifinals. Top boys seed Andrey Rublev of Russia is into the final, where he will meet the winner of the Taylor Fritz - Mikael Ymer (Sweden) match later tonight. No. 2 seed Fritz was not originally planning to play this week, but took a wild card after an early singles loss last week in Mexico City. Every year I do one post explaining the history of ZooTennis.com and how I keep it viable financially. This year's post is a bit later than usual, because for all the gratitude I have for my sponsors and readers, it's easy to put off when there's news to report and tournaments to cover. On the day before Thanksgiving, it seems appropriate to start by acknowledging my direct sponsors: Own The Zone Sports, College Tennis Exposure Camps and IMG Academy. Clicking on their ads and learning more about their products could benefit all of us. I also would be remiss if I didn't mention the Tennis Recruiting Network, which has been publishing my articles for nearly ten years now, giving me an outlet for freelance work that very few writers in my position are fortunate enough to have. In addition to direct advertisers, I have ads delivered from a third party aggregator, which are usually those you see from the major racquet manufacturers. Those ads are seasonal and appear primarily around the slams, but do generate income based on page views and click throughs. 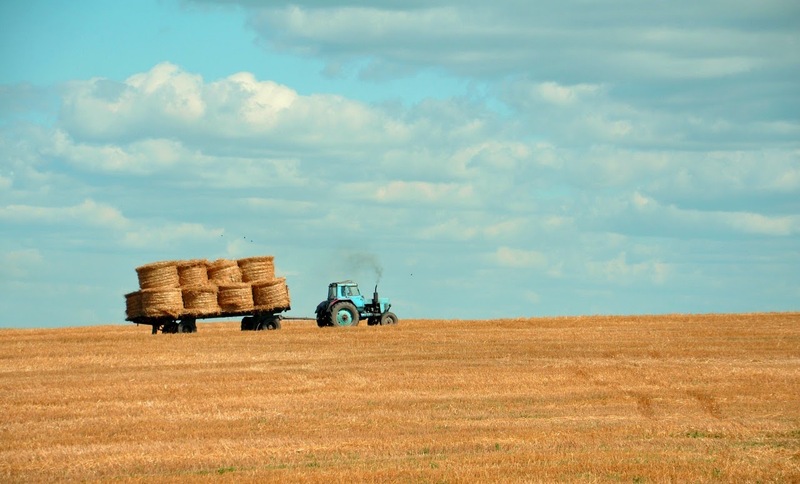 Google ads, generally tailored to the individual reader, are also a source of advertising revenue, based on traffic numbers. 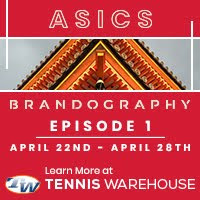 My affiliation with Tennis Warehouse is another longstanding partnership that generates income for the site. If you use the link at the upper left hand corner to purchase from them, I receive a small percentage of the profit. The same goes for Amazon, so if you are going to do Black Friday or Cyber Monday shopping there, please consider using the link on this site. I also have set up a PayPal donation option (see link on the the sidebar at left). I receive contributions throughout the year this way, and I truly appreciate those who take time to acknowledge my efforts by sending actual money. Any amount is welcome, and if you are more comfortable sending a check instead of going through PayPal, my address can be found at the end of this document explaining the ZooTennis advertising rates. If you follow me on twitter, which I know many of you do, please make a point to click through the links back to this site that I post there everyday. I enjoy communicating through twitter, but the financial reality is this: there is no income generated from that medium. I need visitors to this site, and hey, there's always a pretty good photo to check out, even if you don't read the post. I'm also thankful for comments and discussions on the site. I ask for a name--anonymous comments aren't accepted--and for basic civility. I believe there's value in this exchange of ideas, which makes the occasional inappropriate comment worth tolerating. I know it takes a little effort to go through the process of proving you are not a spambot, but I appreciate hearing from coaches, players, parents and fans. 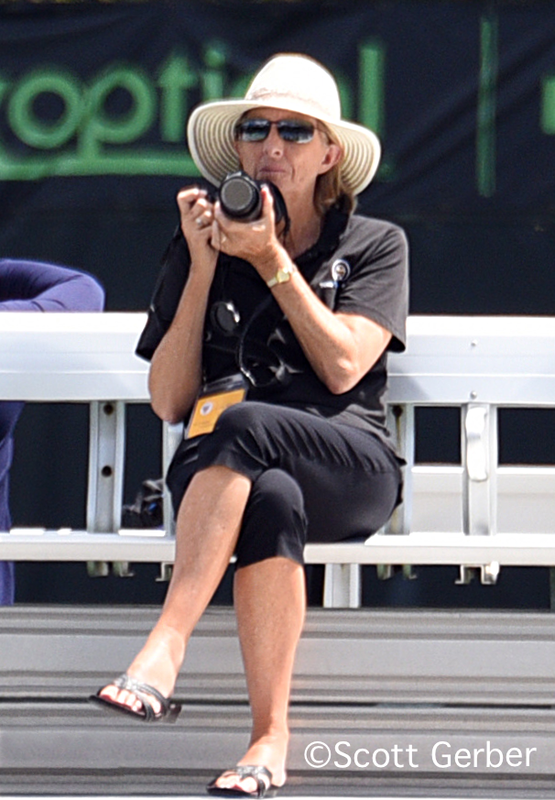 I'll close as I always do, saying I love this work and look forward to keeping ZooTennis.com a free news source for those who share my enthusiasm for junior and college tennis. Thank you, and have a wonderful holiday. My next post, on Friday, will come with a dateline of Bradenton, Florida. The Early Signing Period for Division I ended last week, with many signing announcements still being posted on the schools' athletic websites. 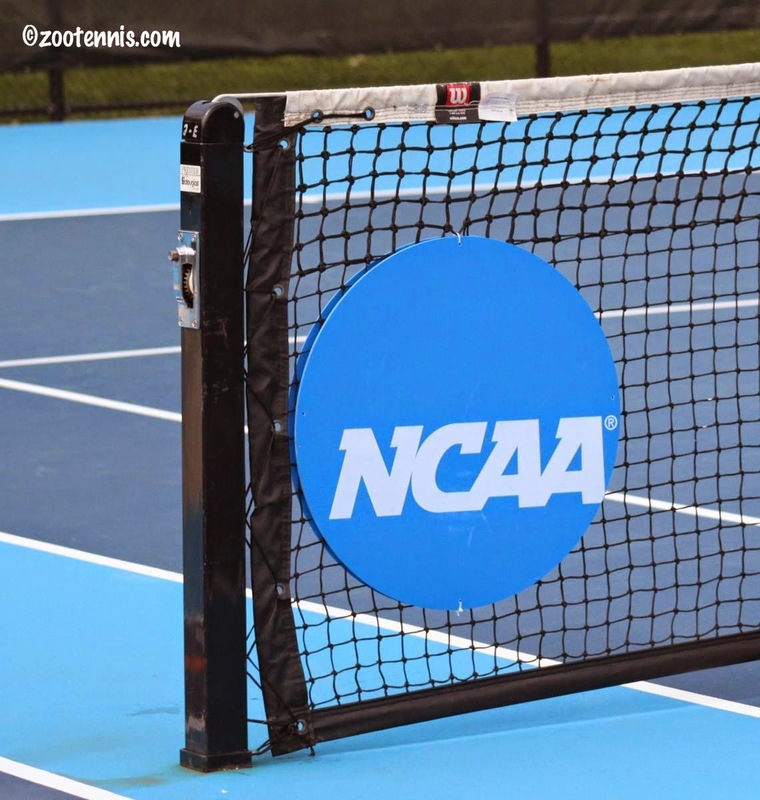 Many commitments are still also appearing on the Tennis Recruiting Network. Not all the commitments are for Fall of 2015; some are starting in January, others are transfers. Here are the major ones I've read; if there are others I've missed, please leave a link in the comments. Two other college notes: The Illinois women have a new assistant coach, Evan Clark, and the Yale women have a new assistant coach Matej Zlatkovic. The USTA has been conducting a playoff for spots on its boys winter 14-and-under team for many years now. Usually in November and December, a group of the top ranked players who turn 14 the following year are invited to compete in a Boca Raton tournament that will decide who will go to the major European winter tournaments in England (now the Nike Junior International Teen Tennis) and France (Les Petits As). The number of players and the playoff system has varied over the years, but the spots are decided on the court, with usually one place reserved for a "captain's pick" after the Eddie Herr results are in. In the past, the girls have been chosen without the benefit of a playoff, but this year they too had a competition to determine three of the spots of the four-player team. Nanda defeated Han in a third place playoff and will also be included on the team. Black defeated Harvey 6-3, 7-6(2) to join McNally and Anisimova on the team. The fourth player will be named later. Both Michael Mmoh and Dalma Galfi of Hungary have been playing great tennis on junior and professional levels recently and that confidence came through in the finals today of the ITF Grade A Abierto Juvenil Mexicano in Mexico City. Galfi, 16, had won two $10,000 ITF Women's Circuit events in Greece coming into the tournament and handled the switch in surface from hard to clay with no problem. Seeded No. 10, Galfi beat second seed Anna Kalinskaya of Russia 5-7, 6-1, 6-0 in the semifinals and claimed her first Grade A title with a 7-6(4), 6-4 victory over No. 6 seed Natalia Vikhlyantseva of Russia in the final. 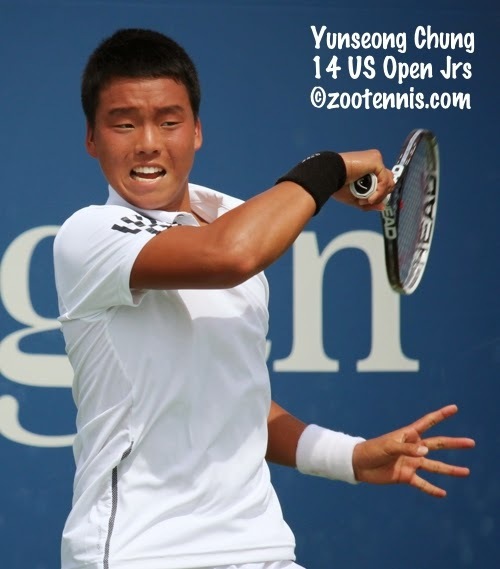 Galfi and Vikhlyantseva were meeting for the first time in ITF junior competition, but Mmoh and his opponent in the final, Seong Chan Hong of Korea, had met twice before. Mmoh had won both, once in 2013 and this year on clay in Belgium, but had needed three sets each time. A large and demonstrative crowd was on hand for both finals, but Mmoh looked to limit their involvement with a quick first set. Hong kept to the previous script however, forcing a third set, before Mmoh prevailed 6-1, 6-7(6), 6-4. Hong, using his speed and an effective drop shot, which shouldn't have surprised Mmoh, but seemed to, was up 4-1 in the second set before Mmoh tied it up and forced the tiebreaker. A perfectly executed drop shot put the 17-year-old Korean up 6-3, but Mmoh held his next two serves and saved a third set point when Hong's forehand sailed long after an extended rally. Mmoh netted a forehand to give Hong a fourth set point, and this time he converted with Mmoh's forehand going wide. The crowd seemed solidly behind the Korean, a slight underdog perhaps as he was the No. 4 seed and Mmoh the No. 3 seed, and Hong gave them plenty to cheer about in the final set, breaking Mmoh at 3-3. Mmoh took a medical time out for what appeared to be a shoulder problem at the changeover and broke Hong to get back on serve, crushing a forehand winner at 30-40 to make it 4-4. Twice in that game a ball was called, or rather not called, in Hong's favor, and twice Mmoh asked for a check of the mark and received a reversal of the call. Displeasure from the crowd, mostly in the form of whistling, did not bother Mmoh and he held his next service game to make it 5-4. In the first point of the final game, yet another call went by the chair umpire went in Mmoh's favor, resulting in a replayed point, but to the crowd's relief, Hong won it. Mmoh hit a good return that handcuffed Hong to make it 15-15 and a deep forehand from Mmoh resulted in a netted reply from Hong. At 15-30 Mmoh won a 16-shot rally with a clean backhand winner, giving him two match points. He took the first, with Hong netting a third-shot forehand, one of the few short rallies in the match. With the win, Mmoh's second Grade A title and first on clay, Mmoh will move closer to his goal of a year-end Top 10 ranking. In the doubles competition, Fanni Stollar gave Hungary its first title of the day, partnering Anna Blinkova of Russia to a 6-1, 6-3 win over unseeded Maia Lumsden of Great Britain and American Ingrid Neel. Stollar and Blinkova were the No. 2 seeds. The tournament closed with the boys doubles final, won by top seeds Taylor Fritz and Andrey Rublev of Russia 6-2, 7-6(6) over unseeded Fabian Fallert and Tim Sandkaulen of Germany. Fallert and Sandkaulen saved six match points, four at 3-5 in the second set, one at 6-5 and one more at 5-6 in the tiebreaker before Fritz finally hit an unreturnable serve to close them out. The second leg of the month-long clay swing in Mexico and Florida is the Grade 1 Yucatan Cup, where qualifying has begun. The fields are not strong, with many players taking a week off before the Eddie Herr-Orange Bowl segment, but Rublev and US Open girls champion Marie Bouzkova of the Czech Republic are entered. Farther west in Mexico, No. 3 seed Daniel Nguyen won the title at the $15,000 Futures in Mazatlan, with the former USC Trojan defeating former UCLA Bruin Marcos Giron 6-0, 2-6, 7-6(0). It is Nguyen's third Futures title of the year, and should move him near the Top 300 after starting the year at 526. At the $10,000 Pensacola Futures, delayed most of the day by rain, 17-year-old Theo Fournerie of France, the No. 6 seed, won his first Futures title, beating former Cal standout Ben McLachlan of New Zealand 6-2, 7-5. That completes the USTA Pro Circuit for the year, with the next Futures in Florida in January. For the 2015 schedules, go to usta.com. Michael Mmoh has been on a tear this fall. After saving match points in the quarterfinals of the Pan American Closed against Tommy Paul, the 16-year-old went on to win that tournament, reach the semifinals of the $15,000 Futures in Mansfield, Texas and win a $15,000 Futures in Brownsville. In his first tournament since his title in Brownsville, Mmoh has reached the final of the ITF Grade A Abierto Juvenil Mexicano, defeating world No. 1 Andrey Rublev of Russia in today's semifinals 7-6(1), 6-4. Mmoh, seeded third, has not dropped a set all week, winning three tiebreakers, all in first sets. Against Rublev, Mmoh had three set points in the opening set with Rublev serving at 5-6, but he failed to convert, even when given the opportunity to feast on a second serve. Rather than mope however, Mmoh stayed positive, and in the tiebreaker he ran out to a 5-1 lead, with Rublev spraying balls all over the court. Rublev was broken at love to open the second set, but Mmoh couldn't capitalize, getting broken himself to make it 1-1. Mmoh broke again and consolidated, but again the 17-year-old Russian came back, gettting it to 3-all when Mmoh chipped in three double faults in losing his serve. With Rublev serving at 5-4, he again went down 15-40, a theme throughout the match, but after saving one break point, he hit a backhand long to get broken, allowing Mmoh to serve for the match. An ace got Mmoh to 40-15, but a great pass from Rublev and a netted forehand by Mmoh made it deuce. Mmoh earned his third match point with a forehand winner, and this time he shut the door, getting in a good first serve that Rublev returned long. Mmoh will play Seong Chan Hong of Korea in the final Sunday. Hong, the No. 4 seed, beat No. 5 seed Mikael Ymer of Sweden 6-0, 6-2. Hong and Mmoh have played twice, with Mmoh winning both, including on clay at the Grade 1 in Belgium this spring, but both matches went to three sets. Live streaming of the finals, starting at 11 a.m. Eastern time can be seen here. Rublev and Taylor Fritz have reached the doubles final, beating Sora Fukuda of Japan and Miomir Kecmanovic of Serbia 6-7(7), 6-4, 10-4. The top seeds will meet unseeded Fabian Fallert and Tim Sandkaulen of Germany in Sunday's final, after Fallert and Sandkaulen beat No. 6 seeds Ulises Blanch and Ymer 6-3, 6-0. The girls singles championship match will feature No. 6 seed Natalia Vikhlyantseva of Russia and No. 10 seed Dalma Galfi of Hungary, who each assured the other wouldn't face a compatriot in the final. Vikhlyantseva defeated No. 3 seed Fanni Stollar of Hungary 7-6(4), 6-1 and Galfi took out No. 9 seed Anna Blinkova of Russia 6-1, 6-3. American Ingrid Neel has reached the girls doubles final with Great Britain's Maia Lumsden. The unseeded pair defeated No. 3 seeds Galfi and Katie Swan of Great Britain 7-5, 6-1 in today's semifinal and will face No. 2 seeds Blinkova and Stollar in Sunday's final. Both Americans lost in the semifinals of the $10,000 Pensacola Futures today, with Justin Shane falling to Ben McLachlan of New Zealand 6-3, 6-4 and Michael Shabaz going out to No. 6 seed Theo Fournerie of France 6-3, 7-6(6). US fortunes were reversed at the $15,000 Futures in Mexico, with Marcos Giron defeating No. 4 seed Darian King of Barbados 6-0, 4-6, 6-3 and No. 3 seed Daniel Nguyen beating Tigre Hank of Mexico 6-2, 6-4. Nguyen is seeking his third Futures title of the year, Giron his second. Andre Dome and Oscar Fabian Matthews lost in the doubles final, with the unseeded Californians falling to No. 3 seeds Christopher Diaz-Figueroa of Guatemala and Luis Patino of Mexico 7-5, 6-3. Jarmere Jenkins won his fifth Futures title of the year and third since October, with the top seed defeating unseeded Jose Statham of New Zealand 6-4, 7-5 in the final of the $15,000 Futures in Australia. In college news, Indiana University has dismissed men's head coach Randy Bloemendaal and assistant coach Sander Koning as a result of the aftermath of an investigation into secondary NCAA violations. In the interim, associate athletic director Jeremy Gray will take over the program and will lead the search for replacements. At the memorial service yesterday for Sean Karl, a video produced by the University of Tennessee provided a look at the impact he had on the lives of those around him, particularly his coaches and teammates. If you knew Sean at all, I urge you watch it, with a box of tissues nearby. The celebration of the beauty of his life can't help but be bittersweet, knowing its impact must now continue without him. The athletic department has also collected the stories and photos of and about Sean posted on Twitter in this post. The video is available here. At the ITF Grade A in Mexico City, the top two seeds in the girls draw were beaten in today's quarterfinals. No. 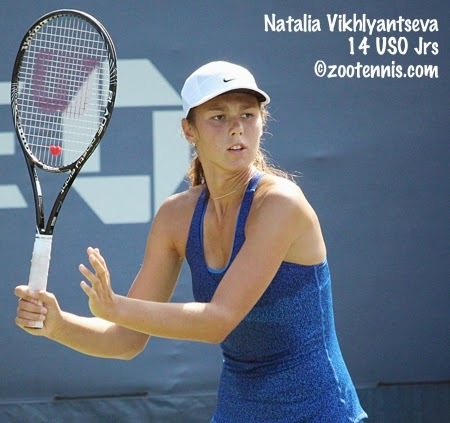 6 seed Natalia Vikhlyantseva of Russia defeated US Open girls champion and top seed Marie Bouzkova of the Czech Republic 6-3, 6-2 and No. 10 seed Dalma Galfi of Hungary downed No. 2 seed Anna Kalinskaya of Russia 5-7, 6-1, 6-0. Vikhlyantseva will play No. 3 seed Fanni Stollar of Hungary and Galfi meets No. 9 seed Anna Blinkova of Russia in Saturday's semifinals. Four of the top five seeds reached the boys semifinals, with only No. 2 seed Taylor Fritz missing. Top seed Andrey Rublev of Russia defeated No. 12 seed William Blumberg 6-3, 6-3 and will face his fourth straight American opponent Saturday in No. 3 seed Michael Mmoh. Mmoh defeated No. 10 seed Mate Valkusz of Hungary 7-6(2), 6-4. The other semifinal features No. 4 seed Seong Chan Hong of Korea against No. 5 seed Mikael Ymer of Sweden. Hong beat No. 9 seed Alejandro Tabilo of Canada 3-6, 6-4, 6-2 and Ymer eliminated the last unseeded player, taking down Fabian Fallert of Germany 6-4, 6-4. The match between Rublev and Mmoh will be streamed not before 2:30 Eastern time in the US here. The girls semifinal between Galfi and Blinkova will be streamed starting at 11 a.m. Eastern. The doubles quarterfinals were completed today, with three US players still in contention. Ulises Blanch, playing with Ymer and seeded No. 6 is in one boys semifinal and Fritz, playing with Rublev and the top seeds, are in the other. Ingrid Neel, playing with Great Britain's Maia Lumsden and unseeded, is the only US girl still competing in Mexico City. At the $10,000 Pensacola Futures, Tommy Paul lost to fellow 17-year-old Theo Fournerie of France 6-4, 3-6, 6-4. No. 6 seed Fournerie joins three former collegians in the semifinals, with former Virginia All-American Michael Shabaz his next opponent. Unseeded Justin Shane, another former Cavalier, defeated No. 3 seed Daniel Garza of Mexico and will be playing in his first Futures semifinal against former Cal star Ben McLachlan of New Zealand. McLachlan and Shane won the doubles title today, defeating current Mississippi State teammates Julian Cash and Florian Lakat 7-6(2), 6-2. The unseeded pair, both 22-year-old who recently completed their eligibility, did not drop a set in the tournament. At the $15,000 Futures in Mexico, Marcos Giron and Daniel Nguyen have advanced to the semifinals. The unseeded Giron beat Andre Dome 7-5, 7-5, and No. 3 seed Nguyen defeated No. 8 seed Fritz Wolmarans of South Africa 6-2, 6-2. Nguyen faces unseeded Tigre Hank of Mexico in one semifinal and Giron plays No. 4 seed Darian King of Barbados. In Australia, top seed Jarmere Jenkins has reached the finals of a $15,000 Futures and will face unseeded Jose Statham of New Zealand in the final. Jenkins is 29-4 in Futures and Challenger play since mid-September. At the Challenger Tour Finals in Sao Paulo Brazil, Blaz Rola lost to wild card Guilherme Clezar of Brazil 6-4, 6-3, a result which kept the 2013 NCAA champion from advancing to the semifinal stage. Clezar, Diego Schwartzman and Rola all went 2-1 in the round robin group, and Rola could have advanced by winning just one set, but Clezar ended up with the better sets won percentage to move on. Last week I had the opportunity to catch up with 2013 NCAA champion Blaz Rola, who was playing in the Champaign Challenger. I had not spoken to Rola since May of 2013, when he won the singles title at the Khan Outdoor Tennis Center at the University of Illinois, so I was eager to hear about his 18 months as a professional, and this article for the Tennis Recruiting Network is the result. He was looking forward to his trip to Sao Paolo Brazil for the ATP Challenger Finals, an eight-player year-end event. The tournament, which is similar to the ATP World Tour final in format, has two round robin groups, with the top two finishers in each moving into the knockout semifinals. Rola, the No. 4 seed, has won his first two matches, beating No. 2 seed Diego Schwartzman of Argentina 6-4, 2-6, 6-3 today to move to the top of the group. I'm no expert on round robin math, but I do know if Rola beats wild card Guilherme Clezar of Brazil, he will advance to the semifinals. Josh Meiseles of the ATP also interviewed Rola in advance of the Challenger Tour Finals. Although there is some overlap in our interviews, I think you'll find both interesting. The quarterfinals are set at the ITF Grade A in Mexico, with only two of the 34 US juniors in the main draw still remaining. No. 3 seed Michael Mmoh beat unseeded Nathan Ponwith 6-4, 6-1, and No. 12 seed William Blumberg defeated unseeded Stefanos Tsitsipas of Greece 5-7, 6-2, 7-5. Blumberg earns a meeting with top seed Andrey Rublev of Russia, who downed Liam Caruana 6-1, 4-6, 6-2, with Rublev looking to beat an American for the third consecutive day. Mmoh will play No. 10 seed Mate Valkusz of Hungary, who defeated No. 8 seed Miomir Kecmanovic of Serbia 6-1, 6-4. All four US girls remaining lost in straight sets. No. 12 seed Michaela Gordon was defeated by No. 6 seed Natalia Vikhlyantseva of Russia 6-1, 6-0 and No. 4 seed Usue Arconada went out to No. 16 seed Tereza Mihalikova of Slovakia 6-2, 7-6(0). Qualifier Alexandra Sanford fell to No. 5 seed Renata Zarazua of Mexico 6-4, 7-5 and unseeded Raquel Pedraza was beaten by No. 10 seed Dalma Galfi of Hungary 6-0, 6-1. Rain kept the quarterfinals in doubles from finishing. Updated draws and Friday's order of play can be found at the tournament website. 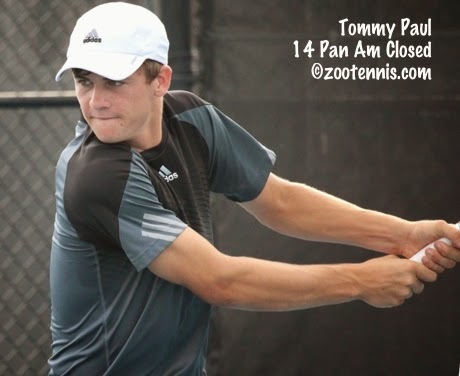 Tommy Paul, who is entered in the Eddie Herr, has been playing Futures since the ITF Grade B1 Pan American Closed, and after reaching the semifinals last week in Niceville, he has advanced to the quarterfinals at the $10,000 Futures tournament in Pensacola. Paul, who has reached four Futures quarterfinals this year, beat top seed Peter Heller of Germany 6-2, 6-4 in today's second round and will play fellow 17-year-old Theo Fournerie of France, the No. 6 seed, on Friday. Fournerie has only played one important junior tournament in each of the past two years--Roland Garros--and he lost in the first round both times. He has reached one Futures final and two semifinals this year. Four former collegians have also advanced to the quarterfinals: Virginia's Justin Shane and Michael Shabaz, Virginia Tech's Patrick Daciek, a qualifier, and Cal's Ben McLachlan. McLachlan and Shane are into the doubles final, where they will play current Mississippi State teammates Julian Cash and Florian Lakat. At the $15,000 Futures in Mexico, Californians Andre Dome and Marcos Giron set up a quarterfinal meeting with wins today. Former Cal Poly All-American Dome defeated top seed Agustin Velotti of Argentina 6-3, 7-6(4), while Giron topped former University of Washington standout and fellow Thousand Oaks, California resident Kyle McMorrow 6-2, 6-3. Two more Southern Californians, Oscar Fabian Matthews (UC-Irvine) and Daniel Nguyen(USC), had advanced to the quarterfinals with wins Wednesday. Matthews advanced with a 6-4, 5-7, 7-6(6) win over No. 2 seed Dimitar Kutrovsky of Bulgaria, who only a week earlier was serving for the match against ATP Top 50 player Adrian Mannarino of France at the Champaign Challenger. Fritz Out, but Eight US Juniors Reach Third Round in Mexico Grade A; Prize Money Restrictions Remain at NCAA; Is Do-It-For-Me Culture Responsible for Decline in US Tennis? No. 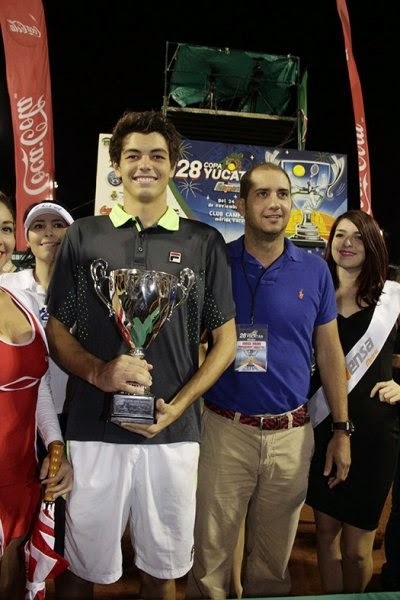 2 seed Taylor Fritz was the day's major upset victim in the second round of the ITF Grade A Abierto Juvenil Mexicano, losing to Jack Lin of Canada 1-6, 7-6, 7-6(5). Fritz was rarely challenged on serve in the games I watched, and he led 4-1 in the final set tiebreaker, but Lin, ranked 279 in the ITF junior rankings compared to Fritz's 13, made fewer errors and played more aggressively in the final few points of the match. Fritz was the highest, but not the only seed to go out. Liam Caruana defeated No. 13 seed Aziz Dougaz of Tunisia 6-0, 6-4, Tim Sandkaulen of Germany eliminated No. 7 seed Sameer Kumar 6-4, 6-4 and Fabian Fallert of Germany beat No. 15 seed Gabriel Roveri Sidney of Brazil 7-6, 4-6, 6-4. In addition to Caruana, the other three US boys into the third round are No. 12 seed William Blumberg, who beat Oscar Janglin of Sweden 6-2. 7-5, No. 3 seed Michael Mmoh, a 7-6, 6-0 winner over Brazil's Felipe Meligeni Rodrigues Alves, and Nathan Ponwith, who beat Mexican wild card Pedro Fernandez Del Valle 6-1, 6-2. All four US boys remaining are in the top half of the draw, with Caruana playing top seed Andrey Rublev of Russia next. The four US girls still in the draw are each in a separate quarter. No. 12 seed Michaela Gordon, who beat Ariana Rahmanparast of Costa Rica 6-4, 3-6, 6-4 today is in the top quarter with US Open girls champion Maria Bouzkova. Qualifier Alexandra Sanford is alive in the second quarter after her 6-1, 6-2 win over No. 11 seed Adeliya Sabirova of Russia and No. 4 seed Usue Arconada has advanced to the third round in her quarter, defeating Juliana Valero of Colombia 6-1, 6-2. In the bottom quarter, Raquel Pedraza beat No. 7 seed Katie Swan 6-1, 6-4, avenging her third round Easter Bowl lost to Swan back in April. Live streaming will continue on the main court Thursday. A link can be found to the stream on the tournament's website. Lisa Stone at Parenting Aces linked to this WRAL.com article about college student-athletes maintaining their amateur status, which centers on Wake Forest's Noah Rubin. With the NCAA facing ever louder judicial and media criticism for the profits generated by college sports, almost none of witch goes to the student-athletes, this topic will not be going away any time soon, even if, in the case of Rubin, he is not generating any profits for the Wake Forest athletic department. The concept of amateur athletic competition seems increasingly outdated, with the International Olympic Committee abandoning it decades ago without any noticeable effect on the viability of the competition. Whether the NCAA will eventually abandon its position remains to be seen, but for now, Rubin cannot keep the money he earns at tournaments without risking his eligibility. Barry Buss has been attending Team USA Player Development sessions in Carson and posting his thoughts on his blog. His latest (there are a couple of f-bombs included), addresses a mindset that I am all too familiar with--the expectation that coaches and parents will 'take care' of everything so their player can focus on his or her tennis. (I do want to add that this is by no means a uniquely American problem). Buss makes many good points about where this leads and why the USTA is powerless to change it. "You need to fix this" has developed into creed, and it's not one that does much for the believer or the society around him or her. What are your thoughts on Buss's post? First Round Complete at ITF Grade A in Mexico; Katrina Adams Assumes USTA President's Role in January; James Blake to Join USTA? The ITF Grade A Abierto Juvenil Mexicano, which was moved from its calendar position at the first of the year for the first time, is underway in Mexico City, with the first round of singles now complete. US juniors make up a large percentage of the participants, with 20 US girls (including six qualifiers) and 14 US boys in the 64-player main draws. Unfortunately 12 of the girls lost in the first round, including No. 15 seed Mia Horvit. Those reaching the second round are Usue Arconada(4), Michaela Gordon(12), Jessica Ho(14), Alexandra Sabe, Ingrid Neel, Raquel Pedraza and qualifiers Alexandra Sanford and Hanna Chang. CiCi Bellis, who was entered, withdrew recently. US Open girls champion Maria Bouzkova of the Czech Republic is the top seed. Although the US boys did not have any qualifiers, with only one American in the qualifying draw, their success rate in the first round was much better, with 10 of the 14 advancing to the second round. First round winners: Taylor Fritz(2), Michael Mmoh(3), Sameer Kumar(7), William Blumberg(12), Kalman Boyd, Liam Caruana, Nathan Ponwith, Mwendwa Mbithi, Catalin Mateas and Anudeep Kodali. Ponwith defeated No. 16 seed Benjamin Hannestad of Denmark 6-4, 6-4. Hannestad was one of only two boys seeds to lose in the first round. Sora Fuduka of Japan, the No. 6 seed, was the other, losing to Stefanos Tsitsipas of Greece 7-5, 7-6(9). That was a tough draw for both players, as Tsitsipas is coming off two Futures quarterfinal appearances in Greece the two weeks prior to this tournament. Doubles play began today, and Mmoh and Fritz, the Pan American Closed champions, are not playing together. Fritz is playing with top seed Andrey Rublev of Russia, and they are the No. 1 seeds. Mmoh is playing with Blumberg, and they are the No. 2 seeds. Arconada and Renata Zarazua of Mexico are the top girls seeds. There is live streaming of center court available all day, with a link available at the tournament website. The website also posts results throughout the day and has the standard ITF order of play. The USTA announced yesterday the incoming board for the January 1, 2015-December 31, 2016 term. 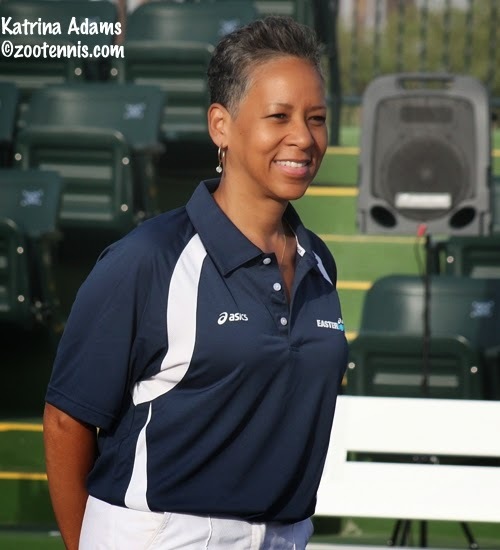 The new chairman, president and chief executive officer is Katrina Adams, a former Northwestern star who has served on the USTA board for ten years. Adams becomes the first former professional player and the first African-American to be elected to the USTA's top position. Adams was inducted into the ITA Women's Collegiate Hall of Fame last weekend and this article from the Northwestern website details her many accomplishments, including the 1987 NCAA doubles title. Three current USTA board members were not nominated again: Jeff Williams of the Tennis Media Company, Ray Benton of the Junior Tennis Champions Center and former professional player Brian Vahaly. The four new board members are Fabrizio Alcobe-Fierro(Florida), Michael J. McNulty III(Southern), Kathleen J. Wu(Texas) and Lauren Barkinow(Northern Californa) in the elite athlete category. The USTA release on Adams and a list of the incoming board members is here. “I like it but I don’t like to travel, I don’t like being on the road 30 weeks out of the year like I was when I was playing,” he said. That doesn't sound like someone who would be on the road working with private coaches in a Player Development role, but if the world beats a path to the new Orlando facility, as the USTA hopes, perhaps that wouldn't be necessary. This photo, by Lloyd Clayton of YourGameFace.com, was taken after a second round Kalamazoo match in 2012, a few months before Karl received his diagnosis. Just over two years ago, at the age of 18, Brentwood Tennessee's Sean Karl was diagnosed with Ewing's Sarcoma, a rare bone and tissue cancer. 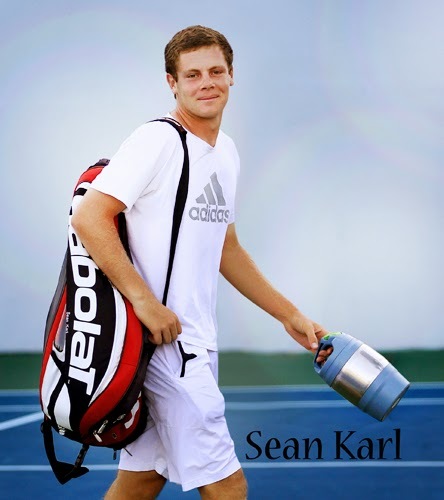 Yesterday Sean died, engulfing the entire junior and college tennis community in sadness. Shortly after his diagnosis in 2012, Sean, one of the top juniors in the country, signed with the University of Tennessee. Although knowing he faced a lengthy regimen of treatment, Sean did not give up on tennis. That he was able to put on an orange Tennessee uniform in the fall of 2013 and play three tournaments, recording five wins, shows the depth of his courage and resolve. The cancer returned, and Sean was no longer able to play, but he continued to be a part of the team, supporting them when possible and even traveling to Athens in May to see teammates Mikelis Libietis and Hunter Reese win the NCAA doubles title. There are few words that can convey the tragedy of a cruel disease taking a life so prematurely. Sean and his family have been an inspiration to all those who have known them, with the grace, the determination and the optimism they have shown in these past two years. He touched so many lives, had so many friends, had such passion for life, that his legacy will be a lasting one. His death is a profound loss to everyone, with expressions of sympathy and sorrow appearing on all forms of social media as the news of his death became known. Tennis and the Tennessee Volunteers were a huge part of Sean's life, and his memory will continue to be honored by those communities. The athletic department has provided a moving tribute to Karl, which can be found here. For background on the Karl family's remarkable courage during the past two years, see this article from the Brentwood, Tennessee homepage. Lisa Stone of Parenting Aces wrote this beautiful eulogy for Sean today. Information on the two services planned for this week, and the opportunity to donate in Sean's memory, are provided at the bottom of that page. It was by no means easy, but Wil Spencer would not be denied the fairy tale ending. After winning four matches in a wild card tournament to get into the main draw of the $10,000 Niceville Futures, the 25-year-old from nearby Ponce de Leon kept collecting win after win in the main draw. When, after nearly three hours of play Sunday, he put away Texas A&M-Corpus Christi senior Peter Nagy 6-4, 2-6, 6-4, the former Georgia star had collected the first Futures title of his career. Prior to this week, Spencer had never won a Futures match, although he hadn't even played in an ITF Men's Circuit tournament since 2008. He went to Texas A&M that year and then after his sophomore year, transferred to Georgia, where he was an All-American in his junior and senior years, finishing in 2012. Spencer played the qualifying of the ATP Atlanta tournament those years, picking up one win in 2011, but after that, he worked at a club in North Carolina, and didn't play any sanctioned events until this week. What prompted him to come back isn't clear, but he couldn't have picked a better place, with a less than star-studded field and the huge support he received from local fans all week. Against Nagy, Spencer fell behind 3-1 in the first set, won four straight games but then got broken serving for the set. He broke Nagy however, and went up 2-0 in the second set, only to lose the next six games. The many fans in attendance, highly unusual for a Futures tournament, were subdued when Spencer was broken in the first game of the third set, making that seven straight games lost, but he broke back in the second game, then went ahead 4-2. The seventh game was a long and tense affair, with nine deuces and Spencer saving three break points to make it 5-2. Serving for the match at 5-3, Spencer had two match points, but Nagy fought those off and broke for 5-4. It was only then that Nagy, a 22-year-old from Hungary, cracked, going down 0-40. He saved one more match point, but Spencer converted his fourth chance to set off an exuberant celebration by the fans. Ken Thomas, who called the match for radiotennis.com, pronounced it the best Pro Circuit match he's called all year, and given the circumstances, it's hard to argue. Although I could only listen, Ken made it clear that the level of play and the competitive spirit of both players was extraordinary, and he was obviously enjoying the chance to witness and comment on such a match. All credit to Nagy, but a Spencer victory was the most satisfying end to the story. Nagy is in the draw in next week's Futures in Pensacola. Spencer did not receive a wild card--those went to Alex Rybakov, Quinton Vega and former Florida State players Anderson Reed and Dominic Cotrone--but after nine matches in eleven days, that may be for the best. At the ITF Asia Oceania Grade B1 in Korea, top seeds Shilin Xu of China and Yunseong Chung of Korea, both 16, won the singles championships. Xu, defending the singles and doubles titles from 2013, again swept both, defeating No. 3 seed Wushuang Zheng of China 7-6(4), 6-2 in the singles final and teaming with Sara Tomic of Australia to take the doubles title. The No. 1 seeds defeated No. 7 seeds Mayka Aikawa and Chihiro Muramatsu of Japan 6-4, 7-5 in the final. By defending both titles, Xu will return to the top of the ITF girls rankings after losing that spot to CiCi Bellis when last year's points from the B1 came off a week earlier. Chung, also the defending champion, will move up in the rankings from his current position of 16 after his 6-1, 7-5 victory in the final over unseeded Naoto Kai of Japan. Given their college background, I probably should devote more coverage to the Bryan twins than I usually do, but it's true they don't lack for recognition. Today the 1998 NCAA champions at Stanford won the World Tour Finals doubles championship, beating Ivan Dodig of Croatia and Marcelo Melo of Brazil. The Bryans had not had great success at this tournament in the past, last winning it in 2009, and they started off with a loss in the round robin competition, but they finished well, beating Dodig and Melo 6-7(5), 6-2, 10-7 in the final. For more from the Bryans, see this article from the ATP. For the second time in two weeks, a collegiate team has taken home the doubles title at the $50,000 Pro Circuit Challenger held on its campus. After Tennessee's Mikelis Libietis and Hunter Reese took last week's title at the Knoxville Challenger, University of Illinois wild cards Ross Guignon and Tim Kopinski followed suit in Champaign, defeating unseeded Frank Dancevic and Adil Shamasdin of Canada 7-6(2), 6-2 in the final. A loud post-football game crowd urged on the pair of seniors, but unlike Guignon and Kopinski's previous two opponents, the college atmosphere didn't seem to both Dancevic and Shamasdin. After Guignon and Kopinski got off to a great start, both holding at love then breaking Shamasdin for a 3-1 first set lead, Dancevic and Shamasdin recovered to 3-3. The Illini pair, who reached the National Indoor finals last weekend but have not won a collegiate major, had two set points on deciding points at 4-5 and 5-6, but the Canadians took both forcing a tiebreaker. A double fault by Shamasdin at 2-4 gave Guignon and Kopinski some breathing room and Guignon served out the set. The second set was much easier, with the Illinois pair taking a 4-0 lead, as Dancevic and Shamasdin made too many unforced errors to threaten to come back. Again it was up to Guignon to serve it out, and he did, at love, to give them the title. According to the USTA's live stream announcer Mike Cation, the $3100 check they received can only be used for expenses but those are not confined to the expenses (or in this case, the lack thereof) of the current tournament. With the 80 points, they will both move up into the 600s in the ATP doubles rankings, which would get them seeded in Futures doubles competition should they try that in January. In the Champaign singles final, top seed Adrian Mannarino of France won his second consecutive Pro Circuit Challenger, with the Knoxville champion defeating qualifier Fredrik Nielsen of Denmark 6-2, 6-2. With the two titles, the 26-year-old Mannarino will now move to a career high in the ATP rankings, beating his previous best of 49. Wil Spencer continued his surprising run today at the Niceville Futures, beating No. 3 seed Jean Yves Aubone 6-3, 6-1 to reach the final of the $10,000 event. The former Georgia All-American will face No. 7 seed Peter Nagy of Hungary in the final, after Nagy defeated 17-year-old Tommy Paul 6-4, 6-3. Nagy is a senior on the Texas A&M-Corpus Christie team. 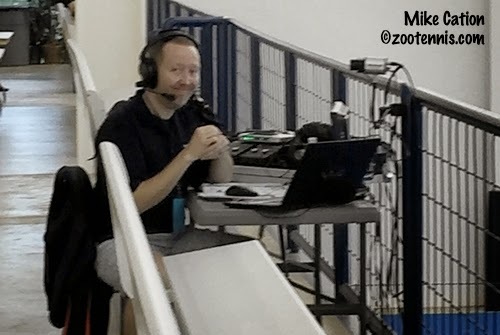 Ken Thomas of radiotennis.com has been providing play-by-play coverage of the tournament. 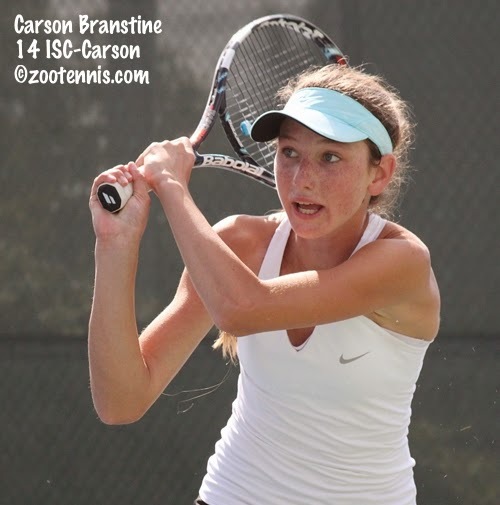 At the ITF Grade 4 at the Evert Academy in Boca Raton, Florida 14-year-old wild card Carson Branstine won her first ITF title. The Southern Californian, who won the 12s Clay Courts last year and was a finalist at the 12s Hard Courts, beat her first seed in today's final, downing No. 3 seed Jade Lewis of New Zealand 7-6(4), 6-3. Branstine has only played in three ITF tournaments, all in the past three weeks, so it didn't take her long to break through. The boys title went to No. 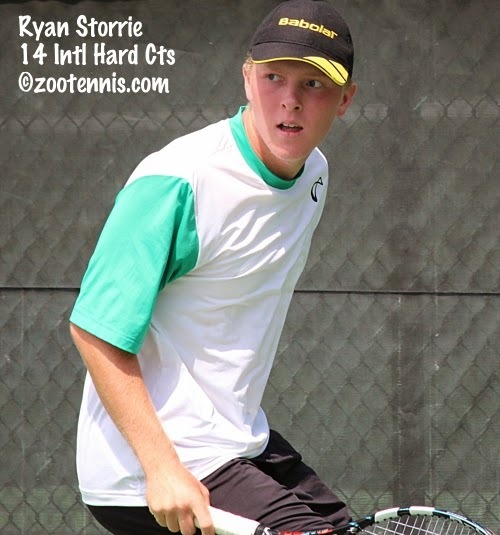 9 seed Ryan Storrie, a 16-year-old from Great Britain, who defeated unseeded 15-year-old Kyrylo Tsygura 6-1, 6-2 in the final. Tsygura had stopped the winning streak of top seed Sam Riffice in the semifinals, beating the winner of the past two ITF Grade 4s in the US 6-7(9), 6-4, 7-5. The title was Storrie's second, both this fall. He also made the final in Wichita Falls, losing to Riffice. Branstine made it a sweep, winning the doubles title with Taylor Johnson. Branstine and Johnson, unseeded, beat Emma Decoste and Kariann Pierre-Louis, also unseeded, 2-6, 7-5, 11-9 in the final. Johnson and Branstine also won the Atlanta ITF doubles title two weeks ago. William Howells also picked up his second doubles title in three weeks. Howells, who won Atlanta with Johnathan Small, partnered Sami Kirberg this week and the pair defeated Jacob Hansen and Robert Loeb 6-2, 4-6, 10-7 in the final. Both teams were unseeded. 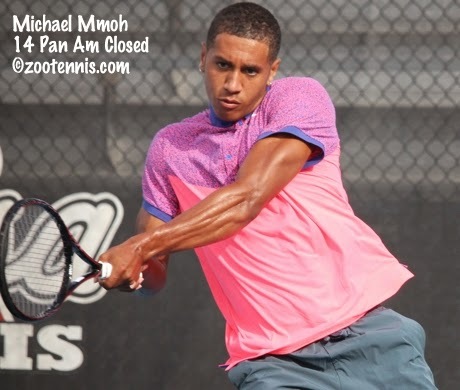 Wil Spencer continued his startling comeback to tennis and 17-year-old Tommy Paul reached his first Futures semifinal at the $10,000 Niceville, Florida Pro Circuit event. 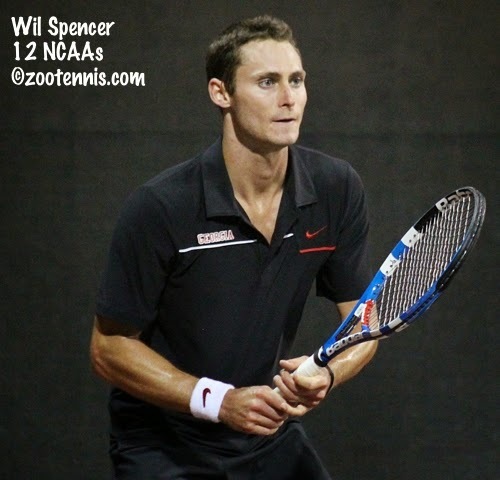 Spencer, the former All-American at the University of Georgia, defeated Reilly Opelka 6-2, 6-4 in quarterfinal action Friday. Spencer had won a wild card tournament to get into the draw, after not having played in sanctioned events in nearly two and a half years. The 25-year-old will meet 26-year-old Jean Yves Aubone, the former Florida State All-American, who is the third seed in the tournament. Aubone defeated qualifier Sora Fukuda of Japan 3-6, 6-3, 6-3 to reach the semifinals, after advancing to the final last week in the Birmingham Futures. Aubone already has one title this week, partnering current Florida State player Benjamin Lock to take the doubles title. Aubone and Lock defeated Randy Blanco of Cuba and Jun Nan Tao of China 6-1, 6-2. Paul, who had made the quarterfinals of a Futures twice before this week, advanced to the semifinals for the first time with a 6-3, 6-4 win over No.5 seed Catalin Gard. Paul will play No. 7 seed Peter Nagy of Hungary, who defeated Ty Trombetta 7-6(6), 7-6(2). For the second consecutive week, a home town wild card college team has reached a $50,000 Challenger doubles final. 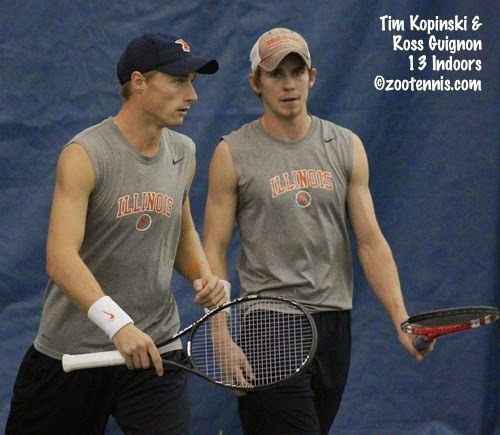 Last week, Mikelis Libietis and Hunter Reese of Tennessee won the Knoxville doubles title, and this week, Tim Kopinski and Ross Guignon of Illinois have reached the Champaign Challenger final. Kopinski and Guignon, who were finalists last Sunday at the USTA/ITA National Indoor Intercollegiate Championships, met the same team that Libietis and Reese had beaten in the final in this evening's semifinal: Portugal's Gastao Elias and Great Britain's Sean Thornley. Helped by a home crowd that appeared to irritate their opponents, the Illini seniors found the balance between composure and energy and defeated the more professionally experienced pair 7-6(3), 6-4. Up 4-1 and serving in the second set, they were broken, but didn't get rattled and finished off the match with confidence. They will play unseeded Frank Dancevic and Adil Shamasdin of Canada in Saturday's final. Dancevic and Shamasdin defeated No. 3 seeds Kevin King and Juan Spir 6-4, 6-4. The singles final has top seed Adrian Mannarino of France going against qualifier Frederik Nielsen of Denmark. Nielsen defeated No. 2 seed Malek Jaziri of Tunisia 6-1, 6-2 this afternoon, and tonight Mannarino held off No. 3 seed Blaz Rola of Slovenia 6-4, 6-4. At the $50,000 Yokohama Challenger, Bradley Klahn and Australian Matt Reid won the doubles title. The unseeded pair defeated top seeds Artem Sitak and Marcus Daniell of New Zealand 4-6, 6-4, 10-7. 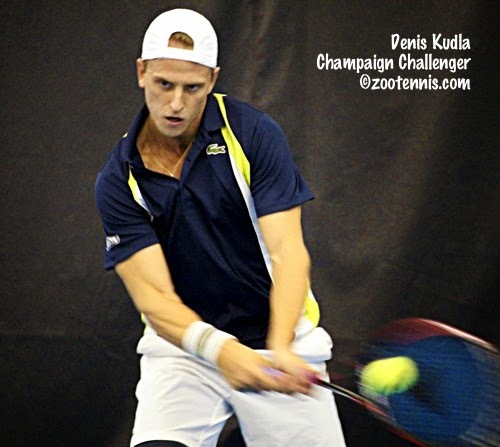 Thursday finished better than it started for Denis Kudla at the Champaign Challenger. Kudla, the No. 5 seed, failed to convert six match points in the second set against qualifier Frederik Nielsen of Denmark and lost 2-6, 7-6(6), 6-2, taking the USTA's Australian Open wild card out of his own hands. Instead, his fate would rest with Marcos Giron, who could win the wild card by reaching the final. Giron was facing ATP No. 51 and Knoxville Challenger champion Adrian Mannarino of France however in the last quarterfinal match of the day, and Mannarino, the top seed, cruised to a 6-2, 6-3 victory. That left Kudla with the most points, by virtue of a Charlottesville semifinal and two quarterfinals (only one counts) in the three designated tournaments. He receives the USTA's reciprocal Australian wild card, joining Irina Falconi, who won hers last week. For the third week in a row, there will be not be an American in the Challenger final. Mannarino will play No. 3 seed Blaz Rola of Slovenia, who defeated No. 8 seed Frank Dancevic of Canada 7-6(3), 7-5 in one semifinal, and Nielsen will play No. 2 seed Malek Jaziri of Tunisia in the other. 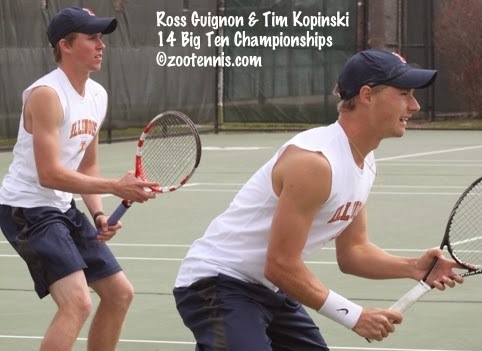 For the second week in a row, the hometown college doubles pairing is making a run, with Ross Guignon and Tim Kopinski of Illinois reaching the semifinals with a 6-7(5), 6-4, 10-5 victory over No. 2 seeds Marcelo Demoliner of Brazil and Roberto Maytin of Venezuela. Guignon and Kopinski, who were finalists at last week's National Indoor Championships, will face unseeded Gastao Elias of Portugal and Sean Thornley of Great Britain, the team that Mikelis Libietis and Hunter Reese of Tennessee beat in the Knoxville Challenger final on Sunday. Juan Spir and Kevin King, the No. 3 seeds, will face unseeded Dancevic and Adil Shamasdin of Canada in the other doubles semifinal. Spencer, now 25, will play 17-year-old Reilly Opelka in the quarterfinals, after Opelka, for the second week in a row, defeated friend Alex Rybakov in the second round. This time the score was 7-6(3), 6-0. Tommy Paul has reached his third career Futures quarterfinal, defeating former Mississippi State player James Chaudry 6-3, 6-1 today. He will play No. 5 seed Catalin Gard in his attempt to reach his first Futures semifinal. Gard, the former Ole Miss star, is now playing under the USA flag according to the ITF, although the ATP still shows his country as Romania. Ty Trombetta and Jean Yves Aubone(3) are the other Americans in the quarterfinals. Aubone and current Florida State junior Benjamin Lock will play for the doubles title on Friday, with the unseeded pair taking on Randy Blanco of Cuba and Jun Nan Tao of China, also unseeded. The ITF announced today that it would be distributing $160,000 of travel grants in conjunction with the first annual ITF Junior Masters this April in China. The Masters tournament, modeled on the year-end finales on the WTA and ATP tours, will feature the top eight boys and the top eight girls in the 2014 final rankings. Unlike the ATP and WTA however, the tournament will not use a round robin format, but everyone will play three matches to determine their place--and their travel grants. All players will receive a minimum of $7000, and champions will receive $15,000. These grants should not affect their college eligibility however, as they are awarded by a federation and are not prize money per se. According to this ITF article, wild cards to pro events will also be included, although at what level is currently undetermined. It never occurred to me that I had not attended a men's ATP Challenger before yesterday. I have been to more than a few Futures events, a few $25,000 women's Pro Circuit tournaments, but my trip to Champaign for the final US Challenger of 2014 was my first in-person look at that level. I'm not sure why that didn't seem to be a gaping hole in the fabric of my tennis coverage, but some of it can be explained by the frequent live streaming the USTA and ATP have undertaken. I've watched a great many matches on my computer the past two or three years, and with the production values so high, and the excellent play-by-play work done by Mike Cation this past 18 months, it's easy to feel as if you have actually been there. Also, the level of tennis at a $50,000 Challenger is not substantially above the Division I college majors, with the players going deep in those three tournaments perfectly capable of winning rounds, if not the actual title, at a Challenger. Witness Julian Lenz of Baylor, who hasn't actually won a collegiate major either, getting to the quarterfinals of the Napa Challenger in September. So how did Champaign stack up to my expectations, based on my Futures and college experiences? Well, it's quieter, at least when compared to college matches. Granted I went early in the week and was there early in the day both Tuesday and today, but for those first matches you could count the actual "fans" as opposed to coaches, entourage, Illinois team members, on one hand. And although the crowd was bigger and louder for Illini senior Farris Gosea's match with Marcos Giron last night, it was still a far cry (or shout) from a typical college dual match. I want to be careful not to draw too many conclusions from one 30-hour trip, especially when it's the last tournament of the year for many of those in the draw. But distinctions often drawn between juniors and pros, in behavior, game management, etc., seem to me to be exaggerated. They still get rattled over line calls, lose focus, whine, fail to exploit a weakness, still make inexplicable errors, still have difficulty serving out a match. That could be why they are not playing in London right now, but I suspect it's part of competing in the sport of tennis, at whatever level. Juniors may lack the range of experience, but the emotions are not all that different. One major difference I observed was in the officiating. I saw two racquet abuses and a ball abuse that would have been point penalties in USTA events and certainly a warning in ITF junior events that were completely ignored by the chair umpires. Most college chair umpires would have also assessed code violations, but there was an obviously reluctance to even warn a player, which puzzled me. Mike Cation, who has seen hundreds of Challenger matches this year, tweeted that the permissiveness I witnessed was standard, not the exception I was hoping it was. With so little of that now at the very top of the men's game, I shudder to think what the lower levels would look like if the top level was less composed than it is. There were a lot more officials, with a chair and five line judges, but that didn't lead to any more agreement with their calls. But no Uniqlo, New Balance or H&M, all of which are represented at the ATP World Tour Finals in London this week. As for the tennis, five seeds, two qualifiers and a wild card have reached the quarterfinals. Rajeev Ram, Jared Donaldson, Noah Rubin and Jared Hiltzik were eliminated from the USTA's Australian Open wild card challenge with losses today, leaving just Marcos Giron to stand in the way of Denis Kudla, and Giron would have to reach the final to pass him. No. 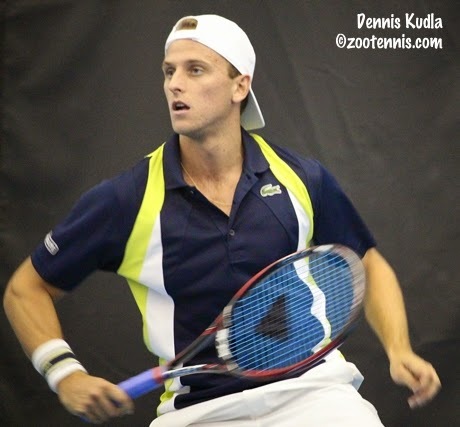 5 seed Kudla defeated Hiltzik 7-5, 6-3 and will meet qualifier Frederik Nielsen of Denmark in Thursday's quarterfinals. Wild card Giron defeated No. 7 seed Gastao Elias of Portugal 6-3, 4-6, 6-4 this evening to earn a shot at top seed Adrian Mannarino of France. Donaldson lost to No. 2 seed Malek Jaziri 3-6, 6-3, 6-4, with the Tunisian moving on to play qualifier Marek Michalicka(CZE), who was sporting some of his Wisconsin Badger gear after his 6-7(5), 6-4, 6-2 win over No. 6 seed James Duckworth of Australia. The other quarterfinal in the top half features No. 3 seed Blaz Rola of Slovenia against No. 8 seed Frank Dancevic of Canada. Dancevic defeated Rubin 6-2, 6-3. Complete results will be available here. I spoke to Rola yesterday about his successful first 18 months on tour after winning the NCAA singles title in 2013, and that interview will be available on Tennis Recruiting Network next week. After Champaign, Rola is heading to Sao Paulo Brazil for the eight-player Challenger Tour Finals, which begin November 19. 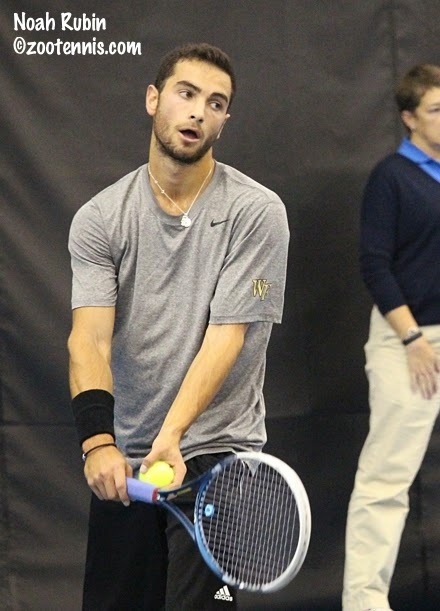 Noah Rubin qualified for the for the $50,000 Challenger Monday in Champaign, a first for the 18-year-old Wake Forest freshman, and another first came just a day later, with Rubin defeating Ed Corrie of Great Britain 6-1, 3-6, 6-2 this evening at the Atkins Tennis Center on the campus of the University of Illinois. "My best tournaments have always been through qualifying," Rubin said. "Wimbledon was through qualifying, my final at the $15,000+H in France was another big one through qualifying. So all of my big ones were when I grind qualies and I come out. I guess it's just momentum, having that competitive spirit all the way through." After a great start, Rubin's level dropped a bit, and Corrie, a 26-year-old who played for the University of Texas, began to find more rhythm lengthening the rallies. Rubin thought his status as a newcomer may have worked in his favor early in the match. "Since I have won too often, or played too often on this tour, people don't know me as much," Rubin said. "It's not like, oh, this is Noah, he does this, he does that. So maybe he was just trying to figure me out a little bit and it took some time. But I thought I was playing solid in the first set, didn't let any balls through, was moving well and I think I kind of surprised him." Rubin fell behind 2-1 in the third set, but immediately got the break back. At 2-2, he saved two break points, winning four points in a row from 15-40 down, and Corrie didn't have a game point after that. The points were often long and physical--Rubin had an impressive hole worn in his shoe from all the violent side to side action--but Rubin felt prepared. "It's great to be out here," Rubin said. "I'm having a great time in school. I'm enjoying myself and working harder than I ever have, and I feel like I'm in the best shape I've ever been. We were grinding a little bit. That's at this level, and the next level is going to be even tougher, so I need to get mentally and physically prepared for that." Rubin's opponent on Wednesday is No. 8 seed Frank Dancevic of Canada, who defeated Kevin King 6-3, 7-5. Rubin and Dancevic have actually played once before, in the first round of the Savannah Challenger this past April, with Dancevic winning 6-1, 7-6(2) on the Har-Tru surface. Although Rubin played the most recent slam as a wild card, getting his US Open main draw berth as the Kalamazoo champion, he is not dreaming of winning the USTA's Australian Open wild card, which is still mathematically possible. "You just play, just have fun," Rubin said. "That's why we're out here." Denis Kudla was a bit more direct in his discussion of the possibility. "It's on my mind, especially now, it's getting tight," said Kudla, who beat Christian Lindell of Sweden 6-2, 6-7(5), 6-1. "Me, (Rajeev) Ram, (Jared)Donaldson, (Tim)Smyczek, we all have some kind of chance, so we'll see. I've never been in this position in a wild card tournament, been this close, with the points thing, I haven't played all the tournaments. But this one, as long as I keep winning, it's on my racquet and I'm happy that it's like that right now." Smyczek lost to qualifier Frederik Nielsen of Denmark 6-2, 1-6, 6-2, ending his chance at the wild card, but Ram won on Monday, and Donaldson defeated Alex Kuznetsov 6-4, 6-4 today to keep his hopes alive. Jared Hiltzik, the University of Illinois junior, plays Kudla in the second round Wednesday, and he too is still in the running for the wild card, as is 2014 NCAA champion Marcos Giron. Giron, a wild card, defeated Illinois senior Farris Gosea of Great Britain 7-6(4), 2-6, 7-6(2). Gosea, a left-hander from Wales who is taking the fall semester off, stayed with Giron on every point, but wasn't able to summon his best tennis, particularly his best serving, in the tiebreakers. Giron served for the match at 5-3 in the third, but double faulted twice and made two errors to give the subdued but significant Illini crowd a reason to make some noise. Gosea was down 0-30 at 5-6, but won the next four points to force the tiebreaker, but he won only one of his four service points, and Giron closed it out. Gosea had 15 aces in the match, but wasn't able to find that weapon when he needed it most. Giron will play No. 7 seed Gastao Elias of Portugal in the second round Wednesday. Donaldson's opponent Wednesday is No. 2 seed Malek Jaziri of Tunisia, who survived a third set tiebreaker against Great Britain's Liam Broady 6-4, 4-6, 7-6(4). Complete results are available here. Wednesday's order of play is here.